Lebanese President Michel Aoun said on Wednesday the differences blocking a deal over a new national unity government were “not easy” and signaled he was at odds with his ally Hezbollah over the last outstanding issue. Five months since an election, prime minister-designate Saad al-Hariri has been unable to clinch a deal on the new government because of the competing demands of rival parties for cabinet seats that are parceled out along sectarian lines. A deal seemed close on Monday when a row over Christian representation was settled with the anti-Hezbollah Christian Lebanese Forces ceding ground to Aoun and his Free Patriotic Movement, which is allied to Shi’ite Hezbollah. But Hezbollah, a powerful armed group backed by Iran, is pressing its demand for one of its Sunni allies to be given a portfolio in the 30-seat cabinet to reflect gains they made in the May 6 parliamentary election. Aoun, in a televised interview, said obstacles “are being created that are not proper and not justified”. 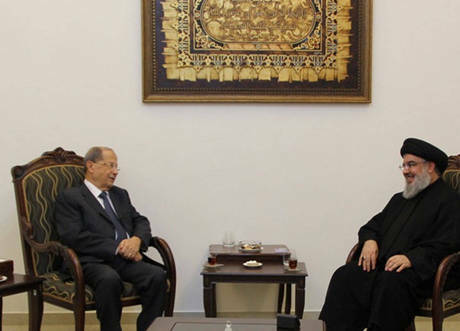 Aoun said the Hezbollah-backed Sunnis amounted to “individuals, not a bloc” and had gathered together “recently” to make their demand for a cabinet post. Hariri, Lebanon’s main Sunni leader, has ruled out ceding one of his cabinet seats to the Hezbollah-allied Sunnis. Another possible way out of the problem would be for Aoun to name one of the Hezbollah allies among a group of ministers allocated to him. But Aoun gave no indication he was willing to do so in the interview marking the second anniversary of his becoming president – a post reserved for a Maronite Christian. Aoun said he wanted a strong prime minister, and not to weaken Hariri. Western-backed Hariri lost more than a third of his seats in the parliamentary election, many of them to the Hezbollah allies. Lebanon is in dire need of a government able to make economic reforms that are seen as more pressing than ever. The country is wrestling with the world’s third largest public debt as a proportion of the economy and stagnant growth.